In very aged condition, an exceptionally rare 16th / 17th Century Prussian backsword made in Solingen by the noted sword maker, Peter Bras von Meigen. Yes it is in very aged, near relic condition. 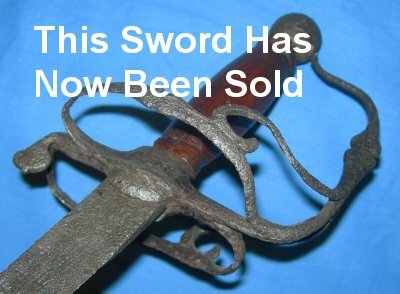 But who else has a genuine Peter Bras von Meigen backsword? Not many people, that is for sure. 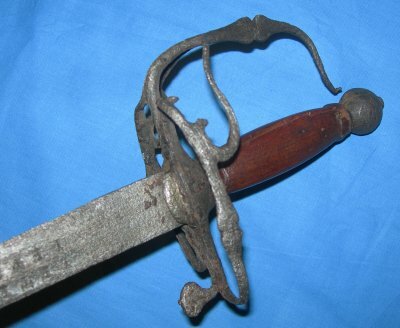 The Bras family were one of the more notable sword makers in Solingen from the 16th to 17th Centuries, but a cursory search on the Internet will show you just how rare their swords are now. The 31 3/4 inch blade is pitted, worn, though the name of the maker is still very clear, and the blade actually has a lovely appearance; clearly folded hand forged steel. The last couple of inches of the blade tip end is bent, not a sharp bend but rounded gradual bend that should straighten if required and done carefully. The blade is firm in the hilt. The hilt is equally pitted and a little squashed with one broken bar; again, it may well be possible to correct this. The wooden grip is a later addition. Further / full sized photos available upon request. Item Ref: 899.